Northampton Town defender Leon McSweeney says the team had a "a lot to prove" before they won their first match in six by beating Accrington. They remain three points from safety in League Two despite the 1-0 win. 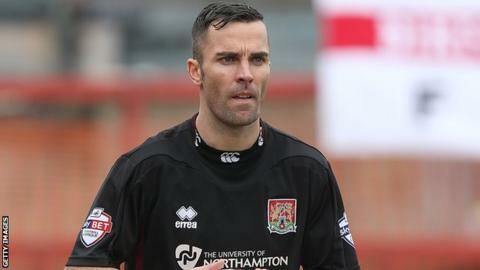 McSweeney told BBC Radio Northampton: "A clean sheet is very satisfying, but to get the win and to get confidence back, it was a very sound day. "We let the fans down in the last game but now we're letting them know we're fighting tooth and nail." He added: "We had a lot to prove after the last home games, conceding the sloppy goals. "We're just sorry we didn't add to the early goal. We had numerous chances but we wouldn't be Northampton if it wasn't squeaky bum time at the end." The clean sheet at Accrington Stanley coincided with the last time the Cobblers did not concede and won the game, at Exeter. "When I came in, we quickly set about creating a strong defensive base and we said if teams are going to score against us, we'll make them work hard for it," said McSweeney, who joined the club in January. "That was the case for seven or eight games and then we let our standards slip. "Now, it's a case now of remembering what we did well, getting back it and getting points on the board." Over 400 Northampton Town fans made up the 1,616 crowd on Saturday and McSweeney says they played a part in the win. "To bring the amount we did, it's fantastic support," he said. "They've been amazing. "It was almost like having an extra defender in there, telling us if there was a man to our right or left and who to pick up - every little helps."